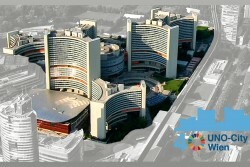 The United Nations Office at Vienna (UNOV): one of the four headquarters of the United Nations. Provides common services to the VIC-based organizations. The Director-General of UNOV represents the Secretary-General in dealings with the host country and diplomatic missions in Vienna. This article includes a total of 1273 words.